It’s nearing the end of June, and I don’t know about you, but with these hot and busy summer days, I don’t feel like cooking much. I’ve been making Weight Watcher recipes that are fast, easy and delicious but don’t require me to put forth a lot of effort in the kitchen. Trust me when I tell you that this Balsamic Roasted Chicken and Vegetables recipe is the perfect dish for this kind of situation. It’s super-fast and easy, tastes amazing and my whole family loves it!! It’s a win-win. This Balsamic Roasted Chicken and Vegetables is so easy that I end up cooking it again and again. It’s easy, so I’ll double or triple the recipe and then freeze the extra marinade. That way, I have it for an even quicker meal in the next week or so. The marinade is what this dish is all about. The dark and rich flavor of the balsamic vinegar mixes with the soy sauce and spicy garlic to create the perfect marinade for the chicken. It’s rich and juicy and oh-so-delicious. It’s important to marinade the chicken overnight so the thighs get the flavor of the marinade soaking deep into the meat. Boneless skinless thighs are the easiest to work with, but you could also use chicken breast if you didn’t want to have the extra point of two of the dark meat. I like thighs in this dish because they’re so much more juicy and flavorful. Allowing the chicken to marinate overnight allows the meat to soak up the marinade and really gets the most delicious flavor. The salt from the soy sauce helps the meat to soak up the marinade and keeps the meat juicy and delicious throughout the whole cooking process. Don’t use full sodium soy sauce, or it’ll end up so salty that you won’t want to eat it! I use carrots and onions in this dish because they’re easy and my family will always eat them. You can marinade the veggies with the chicken if you’d like. The veggies will end up darker from soaking all night in the marinade. You can also swap out the carrots in this dish for your favorite veggies. Or add more veggies so you don’t have to add side dishes. Broccoli, green beans, snap peas, peppers, mushrooms and tomatoes would all be just as delicious in this and won’t add any extra points. I typically roast this, since it only takes about half and hour. That gives me enough time to whip up whatever side dishes I want to serve with it. However, if it’s just too hot for you to contemplate heating up the oven, try grilling the chicken and veggies. Make sure to use a grill pan or cut the veggies big enough they won’t fall through the grate. You’ll end up with chicken and veggies that are juicy and have the delicious marinade, and they’ll have the fabulous smoky flavor from the grill as well. Serve this with some brown rice, pasta or just a nice side salad. This Balsamic Roasted Chicken and Vegetables is just amazing for these hot and busy summer nights. Try these other fabulous and easy summer chicken recipes! 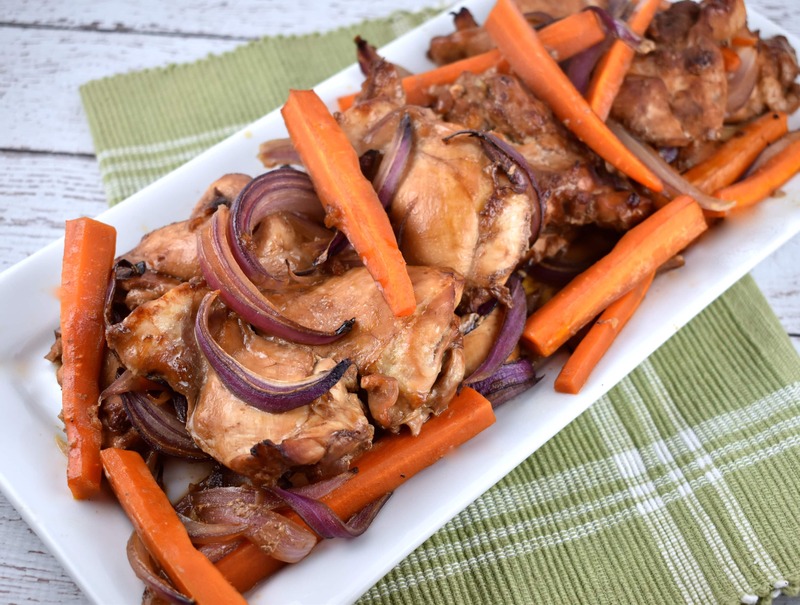 Succulent chicken thighs marinated in a soy balsamic sauce, paired with sweet carrots and onions, makes for an easy and healthy Weight Watchers dinner recipe. In a large bowl, mix together the soy sauce, vinegar, garlic, and salt & pepper. Add in the chicken, cover and marinate overnight. Preheat oven to 425. Mist a large baking dish with cooking spray. Add vegetables in with the chicken, and toss to coat. Transfer veggies, chicken, and marinade to baking dish (do not crowd chicken). Place in oven, and roast for about 30-40 minutes, turning once halfway through, or until chicken is cooked through. PLEEEEEEAAASSEEE fix the print option! love all your recipes and I thank you for sharing. I never print them, I save them in evernotes. I like your recipes, but find them difficult to print, as there is always additional printing over the recipe ingredients. I didn’t used to have this problem while printing your recipes, and it has resulted in trying to copy the ingredients to make sense of the recipe. I wondered if you were aware of this problem, as I read in the comments awhile back, that your recipes were not print friendly. I realized that I wasn’t the only one having problems with printing, and I hope that you can get this issue resolved, as I need all the ideas I can get to stay on Weight Watchers! Thank you for your attention to this matter. I love all your recipes and have made several! Thank you for sharing with us!! Happy Summer! I can’t seem to print recipes from this site – when I click Printer Friendly the preview and the consequent page only contains the photo and description of the recipe, not the actual recipe. Something wrong with your printing link. When I click on Printer Friendly one page prints — the photo and the para describing the recipe — but not the recipe.